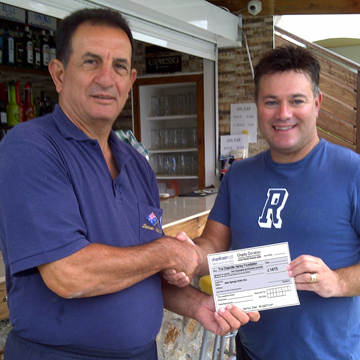 Karl Hartey receives a cheques from George Hatzimihail for £1,232.45. The hotel had been holding Quiz nights and collecting donations throughout the year. The money will be donated to The Great Ormand Street Hospital, London. Karl said " He was very surprised by the donation and overwhelmed with the sum of money." Karl has chosen to pass the money on to Great Ormond Street Hospital to benefit the Children and would like to thank George personally and all the Hotel staff and guests for their contributions. Paul Seager of the Foundation completed the Half Marathon after doubting his distance running in a time of 2.12mins. 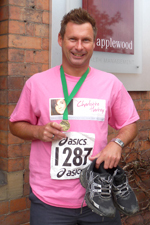 Paul said "I am really pleased to have completed the Half Marathon, my first and possibly last race. I would like to thank all those who sponsored me, raising a grand total of total of £164, and well done to the all of the 1346 runners on the day - good effort!" 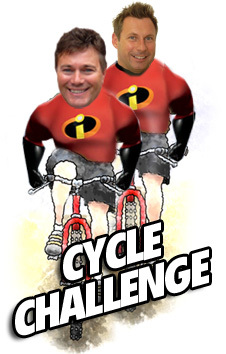 He also said " I will be strictly sticking to biking for the future challenges - easy on the downhill!" We are pleased to announce that Sandra Wynn, Paul Seager, Tracey Bathers, and Jeff Seager completed the Abseil and raised over £200 for the foundation. The event was organised by the Oswestry & Borderland Rotary Club. Karl and Paul were happy to have completed the Wild Edric cycle ride on what was a rather dark and grey day with a cold biting wind! Despite the weather the 100km route took us them the top of the most rewarding hills with some breathtaking views over Shropshire and Wales with safe sweeping descents which were enjoyed. The ride raised over £120in sponsorship. The Incredible conquer Snowdon again! Rev. Stuart Jermy and Karl Hartey lead a group of 11 to the summit of Snowdon on Saturday 23rd July. The group from St Johns Parish Church - Weston Rhyn raised over £1000 to be split between the Church and The Charlotte Hartey Foundation. The pace was leisurely, the route was the Watkin Path. The round trip took a little over 6hrs to complete, despite the cooler temperatures on peaks the day remained warm and dry. Rev. Stuart Jermy said " he was really happy to have yet again been able to help support the foundation and the church in raising funds, and thanked the group for there efforts". 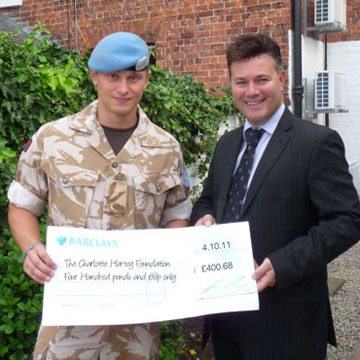 Karl receives a cheque from Ben Richards "our sponsor raising squaddie" after he completed a 26 mile/marathon tab on the 2nd July 2011. Karl Hartey took great pleasure in congratulating Ben on his continued fund raising efforts for the Foundation. In October Ben ran the Cardiff Half Marathon in a respectable time of 1 hour 44 mins and raised over £200 for the foundation. The recent speed march tab was conducted around the area of UNPA or to Ledra Palace, Nicosia, Cyprus. Nine of his squaddie colleagues joined Ben on raising over £400 for the Foundation. Karl said "With people like Ben onboard the foundation will always be strong, Charlotte would have been proud". 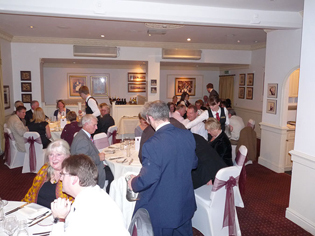 A big thank you to all the guests who attended the wine tasting evening on Tuesday 29th November 2011 for raising a fantastic sum of £600 for The Charlotte Hartey Foundation. The evening was hosted by Momentum Wines and The Wynnstay Hotel. A huge thank you to Mr & Mrs Clarke for their cheque for £300 to the foundation, making the grand sum of £900. Applewood Wealth Management was given the opportunity to invite a group of people to sample the fine wines supplied by Momentum Wines followed by a four course gourmet meal prepared by The Wynnstay's Michelin Star Executive Head Chef Alan Dann. The evening was enjoyed by all. Karl Hartey said " the food, wine and service was exceptional" being known somewhat of a critique by his wife Helen, Karl could not praise the food quality enough and recommends that our local community should go sample the delights of a Michelin Star Chef Alan Dann. We are pleased to announce that the recent Charity Gala dinner at the Lion Quays Hotel raised a grand total of £2,256! We would like to say a massive thank you to all our clients and guests for making the evening a fantastic success. We do hope all who attended enjoyed the night. The Cycling Boys made it! 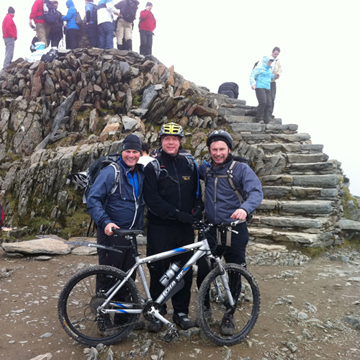 Finally the Mountain Biking Vicar Stuart Jermy, Karl Hartey and Paul Seager cycled to the top of Snowdon on Saturday the 4th April 2011 after a hard 2.5hr trek up the Lamberis Pass. The guys decided to return to the 3560 ft mountain and this time cycle it after their first attempt in January was blighted by snow and turned into a push rather than a cycle! This time the weather was in there favour. Karl said "The climb was tough at times, but the decent was well worth the effort" The sponsorship money collected in total was just over £2,500 for the Foundation. 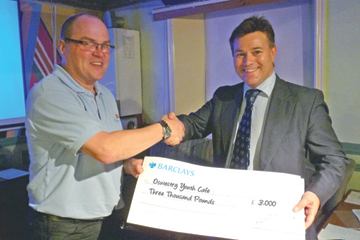 Karl Hartey attended the AGM on the 31.4.11 to present a cheque of £3000 to the Oswestry Youth Café on behalf of the Charlotte Hartey Foundation. This donation will help towards the general running costs and maintenance of the Youth Café. The Café is open 6 days a week and has a varied schedule of activities and it attracts in the region of 40 young people.